In order to check how the lungs are functioning, you need to takelung function tests, which are often called pulmonary function tests, also known as PFTs. The test looks for how much air your lungs can hold, how quickly the air is moving in and out of the lungs, and how successful the lungs are at putting oxygen in the body and removing carbon dioxide from the blood. Those who get these tests are often being tested for lung diseases to see how mature these lung diseases may be and how lung disease treatments are working on the problems. Why Do You Need to Take a Lung Function Test? Measuring how your asthma is affecting your body. Looking into bronchitis or even emphysema. Finding why you may be suffering from shortness of breath. If you have been exposed to chemicals, these tests can measure how harmful they were to your breathing. If you have had surgery, this can also test how well your lungs are performing. Lung function test can also measure how well you are responding to medications. Measuring any treatment that you may be having for lung related diseases. This is the most common type of lung test that is performed. There are several values that are measured, including total lung capacity which measures how much air is in the lungs after an inhale. There is also forced vital capacity which measures how much air you exhale. Also, there is the slow vital capacity which measures how much air you can slowly exhale after a large inhale. This test measures the oxygen and other gases that cross the lungs. This type of test determines how much carbon dioxide and oxygen are in the blood. It can also be used to measure just how well your lungs function with putting a bit of carbon monoxide into the blood. This helps to measure the total lung capacity and the residual volume of the lungs. The total lung capacity measures how much air your lungs can hold, while residual volume of the lungs measures how much air is in the lungs after completely exhaling. Thesetests, also known as provocation studies, will be performed to measure how your airways respond to substances that are known for causing asthma or wheezing. Due to the nature of this test, people are closely monitored to ensure that they can still get the oxygen that their bodies need. 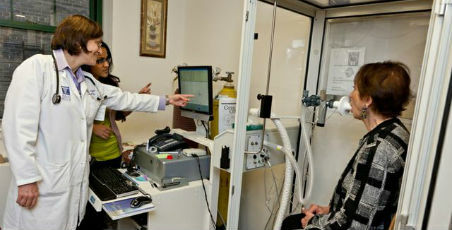 These tests are taken during and after exercise to judge how well the lungs are performing. They often use a combination of spirometry tests to complete this. This is often performed on those with cystic-fibrosis to see how the lungs are functioning. During this test, chemicals are breathed in first before you taking another breath. The amount of gas that you exhale is what determines whether your lungs are working properly or not. Wear loose clothing to allow your lungs to fully inflate. If you wear dentures, be sure to have these in as several tests call for the use of a mouthpiece and you need your denture to form a seal. Avoid eating a large meal before the test as this can affect how well the lungs inflate. Do not exercise or smoke 6 hours before the test. How Is Lung Function Test Performed? The way in which a lung test is performedreally depends upon the type of test that is being completed. For the most part, a nose clip is worn to allow air to only come out of the mouth, which is usually how the lung capacity is measured. In addition, some tests are going to require that you breathe as deeply as possible, while others may have you breath in a chemical then fresh air afterwards. For certain tests, you may sit inside a booth in order to ensure that the doctor can manipulate the air pressure. Most lung tests can happen within 5 minutes or take up to 30 minutes. You should always discuss with your doctor what to expect. How Does Lung Function Test Feel? With most lung tests, you really feel nothing. There may be times in which you feel winded, especially after tests that require deep and fast breathing. Others have complained about feeling out of breath and a little lightheaded. However, you will be given time in between tests to ensure that these ailments do not affect your health. With some tests that require blood tests afterwards, you will have to deal with the pain of taking blood, but this is something most people are used to. If you have to sit in the booth for a pressurized test, you may feel uncomfortable due to the size of the booth. Medications that are given to you may increase your heart rate and this could cause dizziness. The results of your test can be hindered if you do not listen to the doctor’s directions. In addition, medications as well as eating a big meal or being pregnantcan affect these results. There are times when people with chronic pain get abnormal results due to not being able to fully expand their lungs due to the pain. If your results are within the healthy range, your doctor will find nothing wrong. However, if you have restricted air flow, this could signal issues like pneumonia, lung cancer or other related illnesses. Those who have narrowed airways are often dealing with issues like emphysema, bronchitis, asthma or infections.